A partial U.S. government shutdown over President Donald Trump’s demand for $5.7 billion to build a wall along the U.S.-Mexico border entered its 22nd day on Saturday, making it the longest shuttering of federal agencies in U.S. history, with no end in sight. Democrats say Trump shut the government in a “temper tantrum” by refusing to sign bipartisan funding legislation last year that did not include money for his wall. The closure, which began on Dec. 22, broke a decades-old record by a 1995-1996 shutdown under former President Bill Clinton that lasted 21 days. 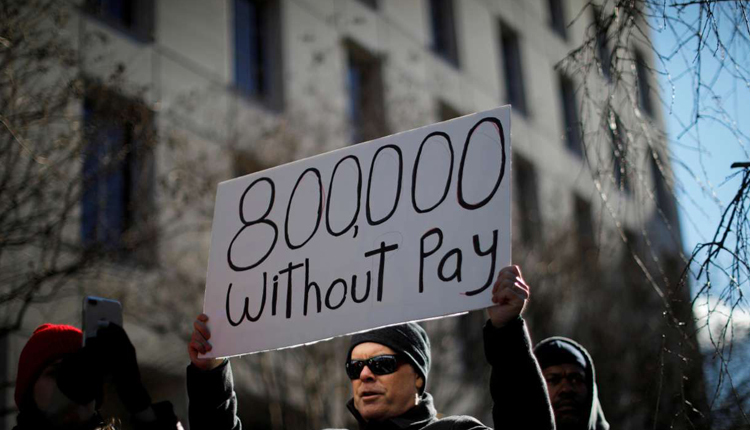 Federal workers affected missed their first paychecks on Friday, heightening concerns about mounting financial pressures on employees, including air traffic controllers and airport security officials who continue to work without pay. A union that represents thousands of air traffic controllers sued the Federal Aviation Administration (FAA) on Friday, saying it had violated federal wage law by failing to pay workers. It is at least the third lawsuit filed by unions on behalf of unpaid workers. The head of the U.S. Secret Service, which is responsible for protecting Trump, has warned employees that financial stress can lead to depression and anxiety. “Keep an eye out for warning signs of trouble,” Director R.D. “Tex” Alles wrote in a memo seen by Reuters. The Transportation Security Administration (TSA), responsible for airport security screening, said its rate of unscheduled absences rose to 5.6 percent on Saturday from 3.3 percent a year ago but that security standards have not been compromised. The FAA, which oversees air traffic controllers, said on Saturday it had seen no unusual rates of sick leave among its controllers and no disruptions to air traffic control operations. To support its workforce, the TSA said it was processing pay for employees who worked on the first day of the shutdown and announced $500 bonuses for uniformed screening officers. Trump is considering a possible national emergency declaration that would end the shutdown and allow him to obtain his wall funding by circumventing Congress. But on Saturday, he told Fox News’ Jeanine Pirro that he would rather Democrats take action, adding that he was waiting at the White House ready to cut a deal. “They think it’s politics. I think it’s bad politics. This country wants to have protection at the border,” Trump said. Democrats, who call a wall an ineffective, outdated answer to a complex problem, have passed several bills in the House of Representatives to reopen the government without funding for Trump’s barrier. But the legislation has been ignored by the Republican-controlled Senate. Trump originally promised Mexico would pay for the wall, which he says is needed to stem the flow of illegal immigrants and drugs. But Mexico has refused. U.S. government departments including the Treasury, Energy, Commerce and State departments, shut down when funding lapsed on Dec. 22. Funding for other portions of the government, including Congress and the Department of Defense, was approved, allowing them to continue regular operations. Trump has repeatedly described the situation at the Mexico border as a “humanitarian crisis” as speculation has increased this week that he would circumvent Congress to begin building his signature wall – a move that would be sure to draw a court challenge from Democrats who say the barrier would be barbaric and ineffective.